I came across this photo and stopped in my tracks as I absolutely love everything about this photo! 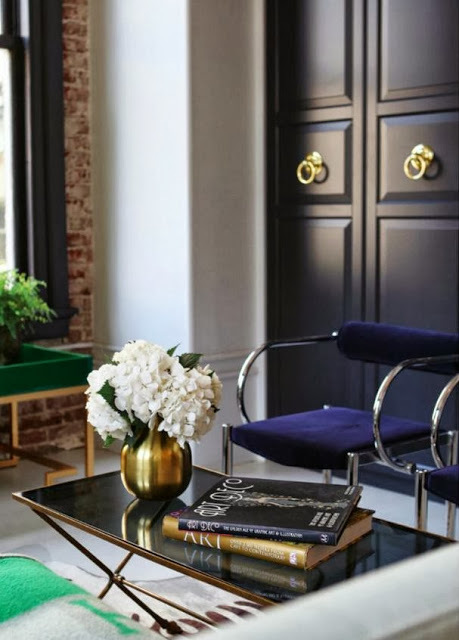 The doors are a knockout and I love the navy velvet chairs paired with the green/gold coffee table. The entire room screams glamour! I hope you have a great day. I’m hoping to post some sneak peeks tomorrow on a couple projects! Fantastic goods from you, man. I’ve understand your stuff previous to and you’re just too wonderful. I actually like what you have acquired here, certainly like what you are stating and the way in which you say it. You make it enjoyable and you still care for to keep it wise. I can not wait to read much more from you. This is really a terrific website. This web page is known as a stroll-by way of for all of the information you wanted about this and didn’t know who to ask. Glimpse here, and you’ll definitely uncover it. I am writing to let you know of the brilliant experience our girl undergone reading through your web page. She discovered so many things, including how it is like to possess a wonderful teaching character to have men and women really easily comprehend selected tricky matters. You actually exceeded people’s expected results. I appreciate you for distributing the powerful, trusted, informative and even unique guidance on that topic to Lizeth. fantastic points altogether, you just received a new reader. What might you suggest about your publish that you made a few days ago? Any sure? What i don’t realize is actually how you are now not really much more neatly-favored than you might be now. You’re very intelligent. You understand therefore considerably with regards to this matter, produced me personally believe it from a lot of numerous angles. Its like men and women are not fascinated except it is something to do with Woman gaga! Your individual stuffs great. At all times take care of it up! I am really enjoying the theme/design of your web site. Do you ever run into any web browser compatibility issues? A handful of my blog audience have complained about my blog not working correctly in Explorer but looks great in Safari. Do you have any ideas to help fix this issue? Normally I don’t learn article on blogs, but I would like to say that this write-up very pressured me to try and do it! Your writing style has been amazed me. Thank you, very great post. Very good written information. It will be useful to anyone who utilizes it, including myself. Keep up the good work – looking forward to more posts. The crux of your writing while appearing agreeable at first, did not really sit very well with me personally after some time. Someplace within the sentences you actually managed to make me a believer but only for a very short while. I nevertheless have a problem with your jumps in assumptions and one might do nicely to fill in those gaps. When you actually can accomplish that, I will undoubtedly be fascinated. I was just seeking this info for a while. After six hours of continuous Googleing, finally I got it in your web site. I wonder what is the lack of Google strategy that do not rank this type of informative websites in top of the list. Generally the top sites are full of garbage. I really like what you guys are usually up too. This kind of clever work and coverage! Keep up the wonderful works guys I’ve included you guys to my own blogroll. It is appropriate time to make some plans for the future and it’s time to be happy. I’ve read this publish and if I could I want to recommend you few attention-grabbing things or advice. Perhaps you could write next articles relating to this article. I wish to read even more things approximately it! My wife and i got now satisfied when John could complete his studies from your precious recommendations he acquired from your own weblog. It’s not at all simplistic to just find yourself giving freely steps other people have been selling. And we also remember we’ve got the website owner to appreciate for that. These explanations you’ve made, the simple blog navigation, the friendships you assist to instill – it is most superb, and it’s helping our son in addition to our family believe that this subject matter is thrilling, which is certainly quite fundamental. Thank you for all! Admiring the dedication you put into your site and detailed information you provide. It’s awesome to come across a blog every once in a while that isn’t the same unwanted rehashed material. Excellent read! I’ve saved your site and I’m including your RSS feeds to my Google account. Hi there, You’ve done a great job. I will certainly digg it and individually suggest to my friends. I’m sure they’ll be benefited from this website. I do believe all the ideas you have presented on your post. They’re really convincing and can certainly work. Still, the posts are very short for novices. May just you please lengthen them a little from subsequent time? Thank you for the post. Hello, Neat post. There is a problem along with your site in internet explorer, could test this… IE nonetheless is the marketplace leader and a good section of people will leave out your excellent writing because of this problem. Really Appreciate this update, how can I make is so that I receive an email whenever there is a new post? I wish to show appreciation to you just for rescuing me from this particular instance. Just after checking through the the net and meeting recommendations which were not productive, I believed my entire life was well over. Being alive devoid of the strategies to the problems you have resolved through your main article content is a critical case, as well as the kind that might have negatively damaged my career if I hadn’t come across your web site. The expertise and kindness in maneuvering almost everything was important. I am not sure what I would have done if I hadn’t come upon such a step like this. I am able to at this moment look forward to my future. Thank you so much for the expert and effective guide. I will not be reluctant to endorse your web sites to any individual who should have guide about this matter. You actually make it seem really easy with your presentation but I in finding this matter to be actually something which I think I would never understand. It kind of feels too complicated and extremely extensive for me. I am having a look ahead in your subsequent put up, I’ll attempt to get the hold of it! Nice post. I study something more difficult on different blogs everyday. It’s going to all the time be stimulating to learn content material from other writers and follow a bit of something from their store. I’d desire to make use of some with the content on my blog whether you don’t mind. Natually I’ll provide you with a link on your net blog. Thanks for sharing.